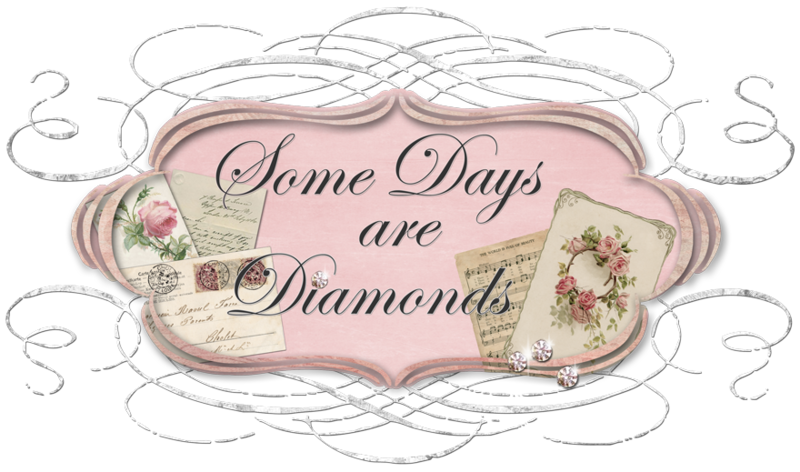 Some Days Are Diamonds: WELCOME BLOGGERETTES! I cannot believe the day is finally here! to a hair-brained idea come to fruition. And today is RUSH day! No other rules - well except one. and take our picture with it. Now we can all see what each other looks like! in our backyard with my picture. and worked around it from there. I am really looking forward to meeting everyone! a Sorority party, just let me know. good time as we embark on this journey. Thanks everyone - this "sisterhood" we have discovered in each other has literally changed my life. I just can't imagine what life would be like without the incredible, wonderful women who are now a part of it. I love you all! to visit all our Sorority Sisters! NOTE! Some of our newest Sisters - from Jill at "Untie the Ribbons" on down - have joined just today! They might not have their Rush project done by Friday but they will get it done. Give them some time and be sure to visit each of them over the weekend! Thanks! I can't tell you how excited I've been waiting for this day to arrive!! I just love your "rush" project, so beautiful as are you!! Lines, what lines?!?!?! Too funny, I'm a Northern California girl, born in San Francisco! I am looking forward to lots of parties with my sisters!! Howdy from Texas!! Girl you look just fine!! I'm up and running in my blogging neighborhood..we Texans can't wait to visit with the rest of the world. Big hugs..and Big thanks for all your hard work! Hey girly! YOU LOOK GREAT! I cheated and put a photo of me and my hubbs in my picture. HOPE that is OK! Thanks for the GREAT parTEE! Hi Karen! Love your project, especially, the roses! ;o) Hope, you got your little package. Thanks for hosting such a great party! Can't wait to meet everyone and for the upcoming events! Your creation is stunning! You really outdid yourself girl, what a beautiful job! I am so happy that we have gotten to meet and I sure am going to try to get out there in August. This is such a fun idea and I better go work on my post! Kudos to you my dear! And you look adorable too! Hi Karen my Bloggerette Sister! I am having so much fun looking at everyone's projects. This is so much fun and I'm glad to be participating. I love what you have made and you look wonderful posing for the camera. This is just the beginning of some very good times. Karen, this is just such a fun and fresh idea, I'm really looking forward to seeing everyone's individual "take" on their project. Love the concept of "sisterhood", and that's what this blogging community really has become. Oh Karen I am starting to see the 'rushes' come up and they are precious, so guess I will get mine up. Karen, you Cutie! I'm so excited about this sorority...what an awesome idea! Your canvas is absolutely Gorgeous!! Wrinkles...schminkles! We've all got them! You're adorable! 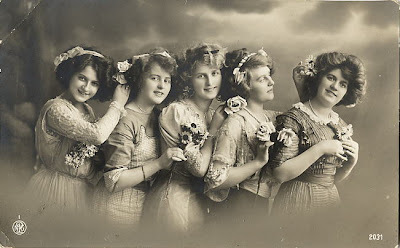 And wonderful picture of the BLOGGERETTE Girls! I'll be posting mine in a moment! Thanks for being our QUEEN! Hello sista...you look great! Beautiful picture. I love those flowers...I can't wait to see all the creations. My post is up! !yeah, I made it!! Oh, this is just so cute! You did a great job and your idea really came to life. I am coming across some neat things on my blogroll. I would have participated but I am so not the crafty type. This is, however, inspirational!! You did a great job and you look darling in your photo! I guess I'll have to be kicked off the list, because I didn't manage to do my project on time - but I guess one less won't matter since you have so many participants. I'm very sorry. I had grand ideas, but time got away from me. I hope you don't mind if I still check in once in a while to see what you all are doing? Woo Hoo at last.. I didn't think this day would ever get here...I'v been so excited and now it's here. Girlfriend, I can't believe how "popular" you are these days! :) I'm loving it! I still remember how we met when you won my drawing... Too cute! This Sorority Idea is tremendous and what you did with the photo is as well! I love it! The little satin flowers are priceless, and I'm sure of it, yes...you made them! Best of luck with this new venture ~ If I can ever get life to slow down enough, I'll be blogging more again. I'm not sure it's gonna happen though unless I start getting up in the wee wee hours of the day before I go off to work. Hi Karen, so happy to be joining you. Your post is beautiful. Thank you so much for all your hard work in putting this together for us. O, Karen, this is so sweet..just darling. This is all so much fun..and altho I don't have a creative bone in my body, it was fun working with the cute photo... and I feel just as you do...I love all my sister friends in Blogland. What a gorgeous project Karen - I'm so excited to be a part of this! That kinda sounds like church, but whatever! Thanks so much for being our housemother! Your art is gorgeous! I too am a Californian from Bakersfield transplanted to Missouri. This is gonna be fun! Woo Hoo Karen...I'm all done with my RUSH and have come to join the PARTY! I took a different spin on my project and did a RUSH RIBBON...but don't worry it has both photos on it...lol Have a great evening and I'm off to drink some wine and find all the Sisters! Karen I just love your creation with the canvas. It is too cute. I just love it, so girly!! Thanks for all you did to get this great sorority going. Looking forward to more surprises Im sure you have in store for us. Karen your project is beautiful, just like you! Great picture of you and your artwork!!! Hey, now I've got wrinkles and I too have earned them. I just turned 55 yeaterday, so you can just imagine how crinkly I am getting. i have been over to visit some of the sisters, and i wanted to pop over and tell you that this is the cutest idea...i am loving seeing what the girls made with their images...your creation is beautiful!!! Your picture is lovely and I am having so much fun visiting all the sisters. I never had a sister before now more than 100! Thank you so much for starting this great idea. Karen--this is so much fun! I'm at my parent's house after a long trip yesterday...we're about to go out to dinner, and I just couldn't resist popping into blogland to check out what was going on with the party! LOVE what you created--and you're absolutely beautiful, my friend! I really think we need a California gathering one of these days! (I'm in the Monterey area). Can't wait to visit everyone...such a wonderful bunch of ladies! Thanks for getting this started--so looking forward to everything! Karen, thank you for hosting this great event. I have my posting up and already received some wonderful comments!!! I am off to see what everyone else has made! I love your art picture...I knew it would be lovely!!! I just joined this evening at 5:25pm and I have accomplished everything on the list but...my project is drying and I need to take a picture. TALK ABOUT RUSHING. I did not see Simply Debbie on the list but I know how very busy you are. Your project is so very pretty and you have a beautiful smile. I put mine up earlier today and have already had some stop by and have visited a few myself. I don't see my name over on the left though, so not sure what's happening. I'm Rebecca from A Rabbit In The Garden. Noticed we had two Rebecca's in the group- shall we do last name initials, such as I would be Rebecca C.? Let me know, don't want to have confusion! WOOHOO! My post is up! I am so excited! Thank you Karen so much for coming up with this great idea and sharing it! It is sooooo much work for you. Oh, Dear Karen, now what do we call you? Sorority Queen? :) Sorority Mom? Well, this was just genius of you to put this together! What fun I've had 'creating' my Rush projects! Now your creation is gorgeous! Love your roses and how you've dressed up the photo. Thank you again for thinking of this fun party! Hey Karen! You are gorgeous and I am so honored to have your as our sorority's president, lol. I LOVE what you did for "Rush". Did you make the flowers yourself? I am still learning how to make flowers like that. I used some on my project as well, but mine were a gift. I am really looking forward to getting to know you and the other sisters better. I can't wait to see what adventures are in store and I'm sure I will host a party at some point as well. If I can do anything, just let me know. i am so sorry. i just didn't get a chance to make or post anything. :( the boys and i spend all day at our local pond and at night i've been pooped from the new summer routine. i love your inspired idea and am so excited for you at all of your sisters. great idea to have everyone include a photo, too. Karen, Thanks again for hosting our sorority! You'll never believe it but when I looked at my picture, I thought I looked like my mom too! Glad to know I'm not the only one. And I'm starting to act like her too! Love your art and so glad to be a part of the sisterhood! A lovely project, I adore roses and your ribbon roses are beautiful. I lived in Southern California most of my life and it is still my favorite place in the world! Thanks for starting this sorority, I do believe we are going to be having a lot of fun getting to know each other. Oh Karen! That is just gorgeous girl! But I knew whatever you made would be! Thanks again for getting this going for us! I have visited half of the list tonight, and will finish up the other half tomorrow and Saturday. Thanks again, sweet friend. Oh Sweet Friend! I love your creation but I knew I would! It is gorgeous just like YOU! Thanks for hosting this party, I can't wait to hop around and see what others have created! Love you bunches my Susta! I did my project and posted it yesterday...but missed the part about taking my photo with it. Darn! I'm in Wisconsin until Monday, but will add my photo as soon as I get home. I hope I can still be in the sorority! Thanks for being such a fine hostess! Im up and running and proud to be a member of such an elite club! Whew!! I finally GOT ON MY COMPUTER (my daughter needed it for course work she's taking this summer semester....rats!!!). Anyway, Karen, I think you look darlin' standing there with your Bloggerette Creation!! Your work was wonderful...and after visiting your Where Women Create post...I can see you are a professional designer! The only sorority I was ever in was an educational one...years ago...and it was BORING!! I'm thinking this one of yours will be such a blast!! OK..I'm really tired...I'll be back in the morning to visit the many other sisters....I can hardly wait!! I'm off to explore all the sisters! Thank you so much for hosting, I look forward to the next event. I feel terrible, I hope to have my project done by FRIDAY!!!! I have been sick all week with a sore throat and have had company and watched baby 3 full days!!! !OH MY, so many excuses, I use to be a get it done early so I could rest and relax kind of girl, or in school so I could PLAY!!!! I promise to get it done!! !may not be anything as great as yours and a few I have seen already, BUt I will get it done!!!! I also need my daughter to get the button onto MY blog, or can I copy and paste it???? OH I have so much to do on friday!!!! Love yours!! !And the darling pic!!! !I saw NO wrinkles!!!!! Hi Karen, my project is done, but I forgot to post a pic of me, sooo.will have to take care of tha in the morning Friday because right now I am in my jammas..well that would have been interesting lol. Im all for a California blogger get together! I just finish my projekt. I may not be an Angel but it felt so right to be an angel on my pillow, Thanks for this heavenly projekt. Absolutely a perfect job of framing the photo. Since I have no printer working, I tried the next best thing---I used my computer program to 'do the initiation'. Thanks for the invitation to join!! This will be a fun and exciting venture!! I love how your project turned out. Thank so much for all your hard work! Your RUSH project is absolutely beautiful as you are too! Can't wait to meet more sisters...especially in Kansas. Enjoy hugs & a fun party all day long! Hi Karen, Please thank all the sisters for remembering me and my family during th death and funeral of my son this past week. I love you all so much and have been so touched. You look beautiful! Love what you did for the party. Have an awesome weekend! Oh Karen, what an exciting and grand day! I am excited about having a new sister and just a clever one too! I love your rush project, it's awesome! Thank you for getting the great Sorority started, as you can tell, it's a huge success! I so nice meeting you, you photograph is just lovely of you! Well Sista, you look fab and so does your canvas! I had to take a quick self-portrait this am - uck! Morning Karen. Rush day. It will be fun to meet every one and see their project. Your is so pretty, nice to "see" you. PS. I was born and raised in So Ca. now relocated though. your rush project is stunning, I just love those shabby ribbon roses. Thanks for letting me join the Sorority at such a late date. Looks like you girls are gonna have a ton of fun :) Love what you did with your photo, the roses are so pretty. I hope to visit some of your lovely 'sisters' over the next few days... blog hopping is fun. Love what you did with your "Sisterhood" picture! I just my post up this morning, I hope to get around to visiting everyone this weekend! what a lovely creation with the old photo! The details are just incredible :)Thanks for hosting this fun event! Such fun for you to host this little Sorority party!!! Amazing connecting with Bloggerettes around the globe! Have a wonderful time viewing everyones creativity!!! Well yours is so very pretty! And, so are you! I am glad to be part of the sisterhood! I am thrilled to bits to be part of this. My RUSH project is finally finished and posted, phew. I love your canvas, the fabric/ribbon flowers are so beautiful. I wish I could make flowers like that, sigh. Can't wait to go off and visit all the other blogs! Loving the sisters song!!!! I am having a blast looking at everyone's projects!! Thanks for setting this up, Karen! what a great project...so cute, I would of joined but my picture would of scared all the other sisters!!!! Ohhhh darlin' what a beautiful piece of work! LOL re earning your lines.. where are they exactly??? But will post on the weekend ... hope that is ok??? Love your Rush item! Ahhh I just remembered I forgot to add a picture of myself. EEks. Anyways, I need your address so that I can send you something. Swing on by my blog to see what it is! Thank you so much Sista! Totally fine if we use the saying that I found! This is going to be so much fun! Oh my gosh, Karen--your picture is beautiful!!! I LOVE the roses!!! AND you look totally young to me!!! Hi there Sister Karen! I'm so glad to see such a great interest and participation in this Sorority! I've posted my "Rush" project, but it leaves something to be desired. I've had company and then been gone for a week now. I know quit making excuses. hehe Glad to be in the Sorority and can't wait to see what happens next. Thanks so much for putting this together. It's been soooo much fun working on the project, as well as getting to meet all these fabulous women! I can't wait to see what's next!! This has absolutely been so much fun!! I've met some really nice "Sisters" and hope to stay in touch with them. Thank you so much for setting up this wonderful affair, and for your kind comment on my page. I've never been in a sorority before either. Now I have wonderful sisters all over blogland. I'm thrilled! It may take me a while, but I'm going to visit each and every one over the next few days. Love your creation! Thanks for doing this for us, it was fun! Thanks for the visit to my blog... I've added my RUSH project since you were there. Come see what ya think? But better late than never!! I've had fun checking out everyone's projects! So much creativity! I know I am late late late but I will have my photo up and ready tomorrow! I have been struggling with Vertigo and my migraines. I will put it up with my apology for the late post but I did not want to miss out on this one! Thank you . Your idea was terrific too! I love the rosettes around the frame. What a talented lady you are! Thanks for being our President Elect!! Thrilled to be rushed in! Lovely project and lovely you! Thanks so much for this too fun sorority. Time to blog hop. Hello sister!! I love your 'rush' project, simply beautiful!! I'm looking forward to meeting our sisters and off to visit each of them right now! Karen, What you did with the sorority picture - it's STUNNING! Very pretty! Thank you for starting the sorority. I'm really looking forward to participating. I have found that bloggers are the nicest people! Hope you are having a great weekend! WHAT a fun sorority! Are you accepting new petitions for enrollment. I wwould work like a mangie and a harpie to get it done by Friday! Your creation is lovely and screams of shabby cottage chic! Stop by for a visit and enter my PINK giveaway! Hi Karen, Just dropping by again to tell you how much fun this rush party has been. I have met lots of new and wonderful bloggers. Looking forward to a great summer and thank you for this fabulous idea. ~ Lynn @thevintagenest. Karen, your rush project is just totally awesome! Such wonderful attention to detail, Honey...you're a pro at this! I've been so busy having fun visiting all the sisters that I failed to stop here first thing. My apologies for that & for misspelling your name *blush* I must have been still sleeping when I way typing. Thank you so much for hosting this wonderfully inspiring meme. I've gotten SEW many ideas...I can't wait for my finger to improve so I can get busy! What fun. Sorry I missed the party! What a great idea you came up with! I just love it! I have been so busy lately that I totally missed out on this, but from I read from your post there will be more fun activities in the future. I will keep an eye out for them! I love your frame .... so pretty! I like your picture too!! Well... I will be busy in the next few days checking out the other "sisters" posts! Oh... love the song on your playlist too! Bravo! Great party!! It took be a little while, but after several sessions I have been able to visit with everyone of your sisters. I wasn't able to leave a comment with each one, but loved every visit. What a fun Rush Party. I loved seeing those who had completed the rush project and how creative each one was. I love your picture! You look great too! I just might make one, even though I missed this lovely rush! Hello Karen, from PA. Your creation is stunning! Truly beautiful. Thanks for this wonderful idea. Unfortunately I posted mine just today and hope you forgive me. I'm enjoying visiting all the other sisters. Have a great 4th! Karen you are beautiful inside and out sweetpea! Take care and thank you so much for organizing this wonderful sisterhood! I love your wired ribbon roses. I love to make ribbon roses, and I do it two different ways. This was one of the best ideas anyone has ever come up with for a blogging challenge. Thanks so much, I have already met so many wonderful women because of it. Very quick . . . I'm going to rearrange the list! Where Bloggers Create II . . .
Mischief makers . . .